In this moment of severe budget cutting people with disabilities do not have time for everything. Ecclesiastes goes back on the shelf. This is not a season for every purpose–rather it’s a time for laughing and crying simultaneously. The hands of the clock are absurd right now for people with disabilities, the numbers appear like obscure writing in a foreign phone book. Let’s say that time doesn’t seem to be on our side; let’s say that time will come around for us in the long view. Certainly this is a good moment for pwds to gather our wits. The Tea Party impetus to slash government spending has lead to what I believe is a wilfully anti-intellectual revisionism about our nation’s social history. You would never know that the arts or rehabilitation programs for the poor have been remarkably successful in generating income; you’d never know that the middle class owes its emergence to beneficent governance. Not if you’re reading the utterances of contemporary pols who have bought into the idea that cutting spending is all that matters. In Kansas where a Tea Party dominated Governor has slashed arts spending to the bone there will be no state wide forum on disabilities and the arts–a program that was scheduled for next week (and where I was to speak). Hope is in short supply for the dominos are falling in the direction of budget cuts that will harm the poor. In New York Andrew Cuomo has opted for cutting aid to the state’s poorest school districts. His rhetoric misses the point, gets muddled in the stampeding syllables of cutting the abstractions. This is my point: whatever cannot be seen (whatever is not a bridge or a road) must be cut. Slashing education and the arts are no joke in a nation that’s falling behind the rest of the developed world in critical thinking. The hands of the clock are pointing to the place where there’s time for nothing. No books. No hope. Not even basic training for a blind kid who wants to learn how to walk safely. What have we come to? The ADA will protect some services. This is a nation of laws and there are certain guarantees. The budget cutters are not operating in a vacuum. It doesn’t take a visionary gleaming to see that certain human rights in this country are guaranteed. But the programs and services that pwds have traditionally relied upon are under savage attack. 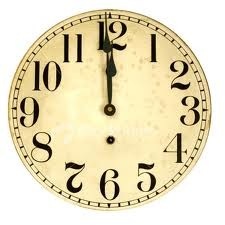 As the poet Donald Justice once wrote: “the hands of the clock are sad”.